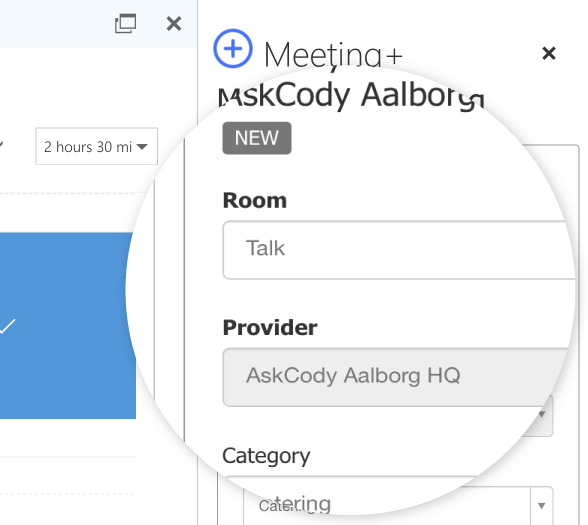 With AskCody Meeting+, the booking experience of meeting services goes to a whole new level and is fully integrated into Outlook and Office 365. The old way of ordering refreshments or additional meeting room equipment such as AV or workstations for a meeting is cumbersome, time-consuming, difficult to administer, and error-prone. Now, booking of Meeting Services runs inside Outlook! Imagine, like a webshop for meeting services. But inside Outlook. With Meeting+, simply book what you want from Outlook or Office 365 on your desktop, laptop, tablet, or phone. The corresponding parties (kitchen, canteen management, AV provider, or facility management) are instantly alerted to your booking needs with exactly what, when, and where you need supplies, and can manage everything from the integrated Service Management tool. AskCody is 100% integrated with Outlook and Office 365. No need for outdated third-party tools, unintegrated Sharepoint sites, 3rd party webpages, or paper-based bookings. 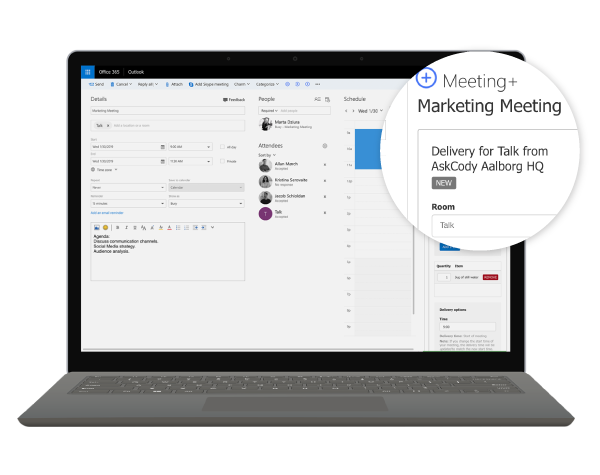 Meeting+ comes as a Modern Add-in for Outlook and Office 365 and runs where Outlook is. There's a complete management backend behind making the experience more efficient and effective than ever for service vendors like kitchen, canteen management, AV provider, or facility management. Imagine, a light-weight IWMS platform for meeting services. Use the AskCody Meeting+ Manager to manage additional resources, workflows, items, bookings of corporate kitchens and canteens, and accept or reject bookings. Kitchen and facility managers can tell at a glance what they need and how many people need meeting service, as well as the location of the service. Now they have an instant one-stop interface with an updated overview in real time. 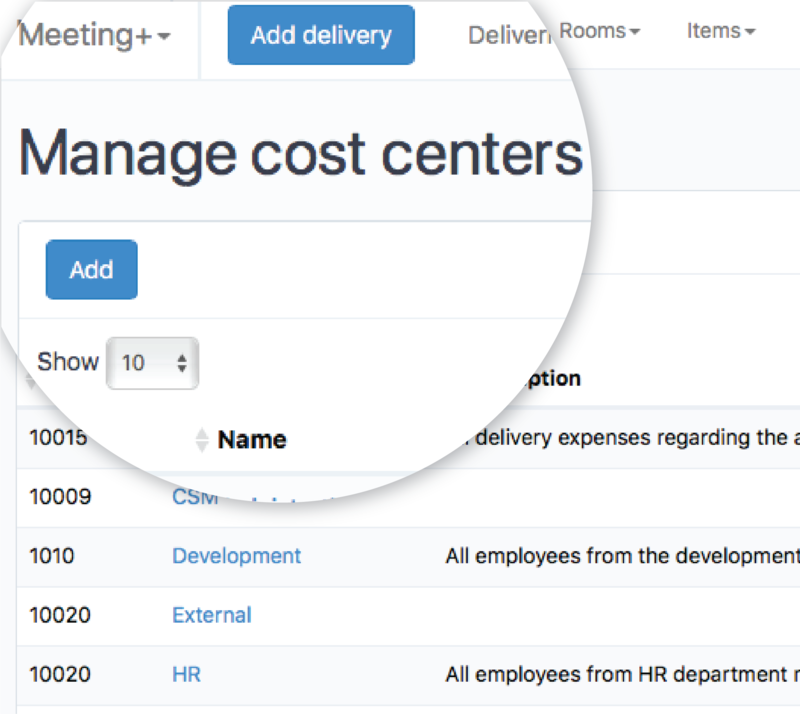 Meeting+ lets you define mandatory and optional input fields when ordering service, in terms of Tax Information, User Information, and Cost Center Management. This makes you IT and Finance Department fell in love with Meeting+ immediately. IT and Finance will love the ease-of-use associated with the data export in the AskCody Meeting+ Manager. Data is simply exported to incorporate with accounting, databases, and ERP, either by simply CSV exports or with our JSON API. User Information is managed by Active Directory to save clicks and ensure correct user data every time. Hereby time-consuming and manual processes are automated to help IT and Finance save a huge amount of time every day. What AV support is available? AskCody provides many ways to order and manage your audio visual needs. Does AskCody software integrate with both Outlook and Office 365? We have a close collaboration with Microsoft and our product suite is 100% integrated with Office 365 and Outlook. No need for manual processes or outdated third-party tools, unintegrated Sharepoint sites, or paper-based booking. Everything works within the familiar Outlook and Office interface. AskCody is based on modern integrations into Exchange and everything is built on Azure. Learn more about how we integrate to Exchange and Office 365 on our knowledge base. What happens to my catering or services order when meetings are cancelled or rescheduled? Catering and additional resources follow your meeting. That's one of the best parts. Meetings are cancelled, rescheduled, postponed, or relocated all the time. That’s why all the assigned resources such as catering, AV and telepresence, meeting room equipment, and table arrangements follow the meeting if it is rescheduled. 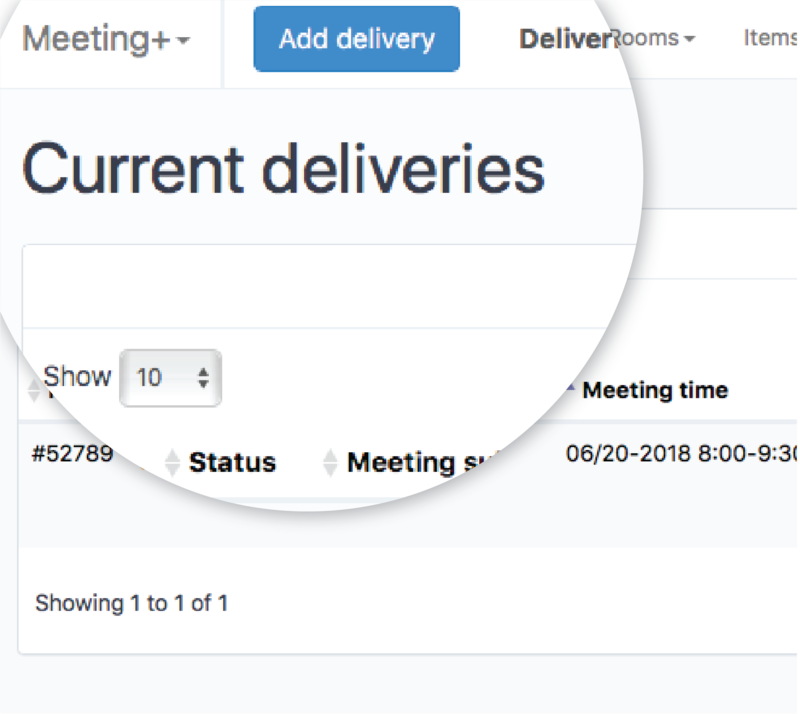 If a meeting is cancelled, the assigned resources will be released automatically. The kitchen or the AV provider will be notified immediately from the AskCody Management Portal. Do AskCody add-ins work across all Outlook platforms? Outlook, Outlook Web App, or OWA for Devices. The RoomFinder and Meeting+ add-in, as well as the Welcome+ Visitor Management Add-in work seamlessly across all platforms, making it easy for you to book meetings and meeting resources. 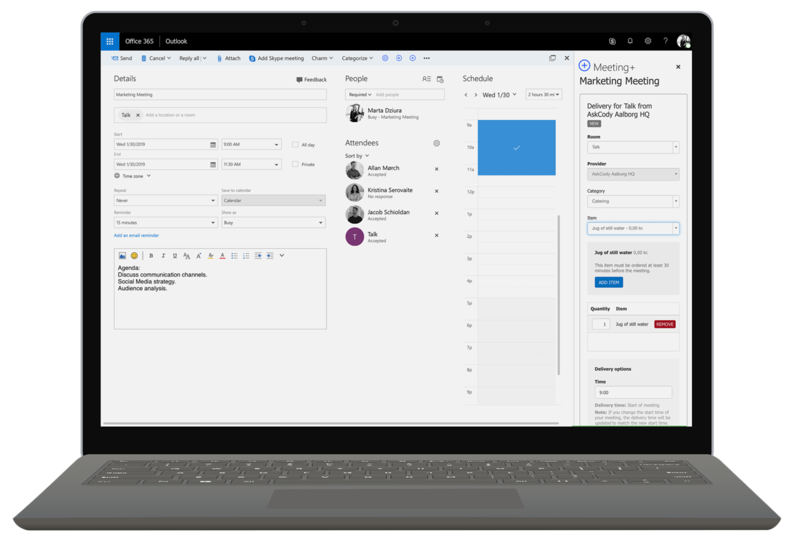 Now you and your organization only need Outlook and AskCody to handle everything related to productivity, mail and collaboration, and meeting management. Can data be exported? And what about cost center management or tax management for external meetings? With AskCody you get the data you need when you need it. Your IT or Finance department will love the ease-of-use associated with the data export in the AskCody Meeting+ Manager. Data is simply exported to incorporate with accounting, databases, and ERP through simple CSV exports or by leveraging the AskCody API. Cost Centers can be managed manually in AskCody or by your Active Directory. Invoices, tax management for external meetings, and settlements can all be taken care of by AskCody. How do vendors or service providers work with AskCody? AskCody is not your everyday Outlook add-in. There's a complete management backend designed to make the meeting experience more efficient and effective than ever. Use the AskCody Manager to manage additional resources, workflows, items, bookings of corporate kitchens and canteens, and accept or reject bookings. Kitchen and facility managers can view at a glance what they need and how many people need meeting services, as well as the location. Now they have an instant one-stop interface with an updated overview in real time. Will the AskCody add-ins for Outlook work together with the other AskCody modules? Use RoomFinder and Meeting+ together with Insights and see your workspace in full context. With Insights, you have access to all available data for office space and meeting room utilization. Easily see how your office space and meeting rooms are actually being used, and make the most out of your workspace. With the meeting room trifecta RoomFinder, Meeting+, and Insights, you can go deeper into conference room activity, with daily reporting for key metrics such as meetings and occupancy, no shows and ghost meetings, duration, and attendees. Get the insights and trends displayed in a beautiful dashboard for easy data consumption. 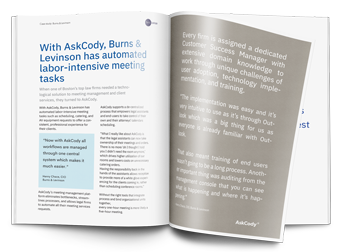 With AskCody, Burns & Levinson has automated labor-intensive meeting tasks. Download the case study and see how AskCody helped one of the Boston's law firms handle with meeting management. “Everything is integrated with Office 365, and all employees can with Outlook and AskCody seamlessly find available meeting rooms and book services for their meetings."